You know those people: they're always looking for the most avant garde, adrift from the mainstream, alternative music. Mostly their discovery process and the gems found exist to display their self-defined artistic elitism to the ignorant Philistine masses in the streets, or simply one up their latte toting, veggie burger munching friends. With the Drool Brothers latest Ajax Muffler, I give you something with which you can slap that stupid pinot grigio grin off their faces. Drool Brothers' Ajax Muffler, if anything, by very definition is alternative music. You will not find them anywhere upon the muddy waters of American mainstream, Spin magazine, rock. Their music is innovative and eclectic; at once incomprehensible and detached, but then accessible and catchy. Ajax Muffler sounds like a collision, orchestrated by director John Waters, at a foggy four-way intersection between the Talking Heads, Crack The Sky, Zappa and the The B-52s. They make Jack White's eccentric, yet commercial teasing, projects look like disturbing Levittown* normalcy. The resulting music is both creative and distracting. There's the weird garage psychedelia of Short Term Memory Loss or Time Bomb. Or the slow art rock and tongue in cheek lyrics of I Only Like Love. Strangeness is the rule on Japanese Disco, but more so on the awkwardly obtuse musical inside joke of Flapmaggot. Against these Drool Brothers can be remarkably clever and accessible with the plucky alt rock found on Ordinary Wonderful Life, Misery Ride, and the upbeat and 60's surreal Analog Boy. There's much to digest on Ajax Muffler, and it's ultimately worth the venture, and plenty to keep the snotty, tofu eating, alternative rock mob paranoid and confused about your musical sensibilities. 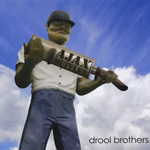 Drool Brothers' Ajax Muffler may be too much eclectic alternative art rock for most readers of Dangerdog Music Reviews. But, most times, I found the music strangely compelling if only for its innovation and diversity. In the end, however, I think I'll only pull out to mystify and defy the alt rock snobs that sneer when I'm listening to Iron Maiden. *Levittown is a pre-planned post World War 2 suburban Philadelphia development known for its predictable layout and cookie-cutter homes. Drool Brothers' Ajax Muffler, if anything, by very definition is alternative music. You will not find them anywhere upon the muddy waters of American mainstream rock. There music innovative and eclectic; at once incomprehensive and detached, but then also accessible and catchy.